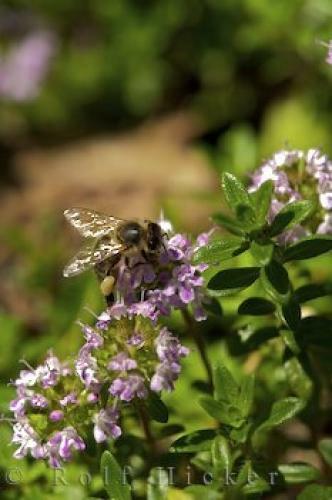 A honey bee makes use of the nectar it finds on a thymus vulgaris herb plant in the Provence of France. A bee on a Flowering Tyme plant, Tyme sariette at La Source Parfumee Gardens near the village of Gourdon, Gorges du Loup, Alpes Maritimes, Provence, France, Europe. Vulgaris Herb Plant in the Provence.